Ireland's River Shannon is named after Sionnan, who was the granddaughter of the Mythological God of the Sea, known as Manannan Mac Lir. As the legend goes, she came to this spot to eat the forbidden fruit from the Tree of Knowledge, which was planted by the Druids. As she began to eat, the waters of the pool sprang up and consumed her, eventually to flow out across the land. According to another Irish legend, Rowan trees once dropped their bright red berries into a well full of salmon. Fish that ate the berries would gain red spots and great wisdom, and all the Irish men tried to catch and eat these Fish of Knowledge. However, women were forbidden to catch the salmon. One day, a brave female rebel named Sionnan caught and ate one of the wise fish. Suddenly, a great flood burst from the well and carried her away to the sea. The Shannon began flowing along its present course after the end of the Ice Age. In 300 BC, the Roman, Ptolemy, mapped the river when it was an important trade route from Europe. 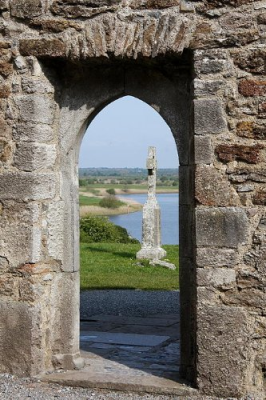 During the first millennium AD, Viking long boats sailed up the river to loot the medieval monastery at Clonmacnois, and found a town at Rindoon on Lough Ree. Brian Boru, the High King of Ireland, broke the power of the Vikings at the battle of Clontarf in 1014. He deployed a fleet of war ships on Lough Ree to deal with the Viking threat. Because of it's proximity in the Irish midlands, the Shannon was of major strategic importance in military campaigns in Ireland during the 17th century. In the Irish Confederate Wars, the Irish retreated behind the Shannon in 1650 and held out for two more years against the English. Threatened by death, Oliver Cromwell forced the remaining Irish landowners west across the River Shannon. This freed up the landholdings in the east for the incoming English settlers. Rising from the moors of County Cavan, Ireland's River Shannon almost divides the country into two halves. Dominating the landscape, the river has acted as a barrier to movement from the east to the west, while providing a water route from north to south. The Shannon is the longest river in Ireland and Britain, and has greatly influenced Irish history since the beginning of time. 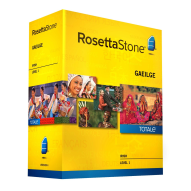 Over 200 miles from its source to the sea, it travels through over a dozen lakes and passes more then a hundred islands. There are also dozens of smaller rivers and streams branching off from the Shannon. 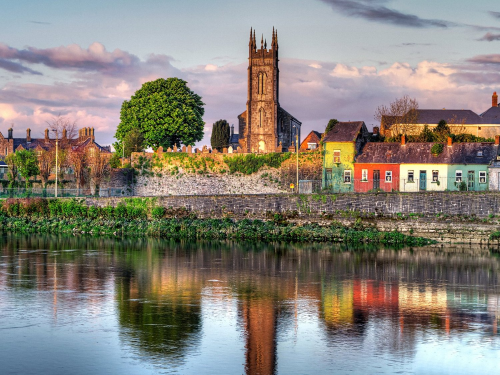 Along its banks are dozens of historic towns, castles, and monasteries that testify to Ireland's turbulent history. The river's flood plain is dotted with marshy grasslands and bogs that support many species of birds and other wildlife, but for many anglers, it is the salmon that draws them to the river. The river is now the backbone of a vast network of inland waterways, joined to the Erne via the newly restored Shannon-Erne Waterway. Navigation is simple since the deep channel is marked to keep sailors on course. The Erne has only one lock, the Shannon has six, and the Shannon-Erne link has sixteen. The Grand Canal connects Dublin and the east coast, while the Barrow Navigation makes it possible to travel to the south east. Sailing southwards down river brings the traveler through Limerick and out to the Atlantic Ocean. Future developments include a possibility of reopening the Ulster Canal, connecting the Erne to Lough Neagh, Ireland's largest lake. Today, there are water taxi's that run up and down the Shannon. They even have a "moonlight cruise" for the more romantically inclined. 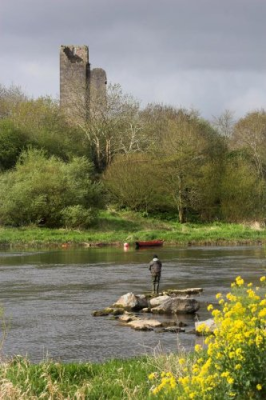 Salmon fishing is one of Ireland's most important industries. For centuries, the fish's habits were a mystery. Young fish would appear in the river each spring, only to seemingly disappear. Now, we know that Atlantic salmon are born in fresh water but spend some of their lives at sea. The cycle begins each autumn, when adult salmon swim into the Shannon from the sea to spawn, and in the spring, the newborn emerge. As the young salmon grow, they develop vertical bars on their sides and head out to sea For a span of a year or so, they may travel thousands of miles in the ocean. Then, the adult fish find their way back to their birth rivers to continue the cycle. Once, tens of thousands of salmon would return to the Shannon to spawn. Today, special hatcheries are needed to help sustain the Shannon's salmon runs. It is said that if you listen closely you can still hear some of the fish whisper Sionnan's name.